Maybelline have just launched a new product to make it extra easy to get expert looking eye make-up. 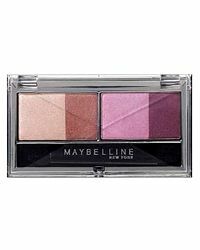 Their Expert Wear Eye Studio Quad Eye Shadow has everything you need to create flawless eye make-up in a handy compact. There are four complementing shades of eyeshadow, and with six different colour schemes available there’s one for day and evening wear for every skin tone. The eyeshadows included are specifically designed for applying a base, lining the eyes, a main eyeshadow colour, and highlighting contours and creases, for a fully finished look. What’s even better is that you don’t need to carry around for separate products, especially eyeliners which are the perfect size for getting lost in over-sized handbags. The Quad Eye Shadow is also a bargain at only £6.84. You can get them nationwide now.